"Of all the female entertainers Lautrec celebrated in his posters, Jane Avril and Yvette Guilbert were the two with whom he maintained the longest friendships. He portrayed them both together in one of his most brilliant posters, Divan Japonais. Although Guilbert was the performer at this rather shabby cabaret when it opened in the spring of 1893, Lautrec made the half-Italian Avril the focal figure in his composition. Under a shock of red-orange hair topped with a pagoda-shaped hat and towering plume, her black. silhouetted figure dominates the frontal plane as she assumes a regal pose and an attitude of hauteur. Neither she nor her companion, Edouard Dujardin, the distinguished founder of the Symbolist Revue Wagnerienne, deign to look at Guilbert on stage, whom Lautrec has portrayed as acephalous, probably as a witty response to her complaint that he caricatured he and made her ugly." This image shows Lautrec's mastery of bold design and simplification of line and color. to appreciate the revolutionary aspect of this design, one need only compare it to other Divan Japonais posters of the period, such as those of Maurice Millière. 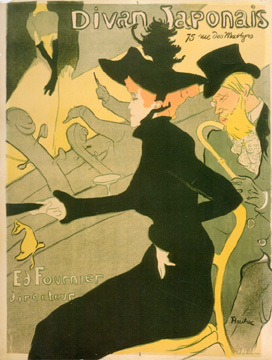 One of the methods which accomplished this stark contrast was Lautrec's "good use of spatter, a technique which adds another dimension to poster art: here, for example, it effectively separates the solid black of Jane's dress from the less important dark mass of the bar and the orchestra. Spatter can also add depth and 3 dimensionality, and Toulouse-Lautrec was to use it in much of his lithographic work; yet, surprisingly enough, it is rarely if ever employed by other posterists, perhaps because of the sheer technical difficulty of it. But he, having acquired the skills of a lithographer, could work right alongside the printer and achieve whatever effect he desired"